If new or changed application systems are needed in order to support the ITIL processes, these must first be procured or developed and implemented. The functional requirements of the application systems are mainly derived from the detailed process descriptions - these illustrate which activities the application system is to support. Further requirements may be added (example: "The creation of a new Incident must be possible from within the Outlook address book"). 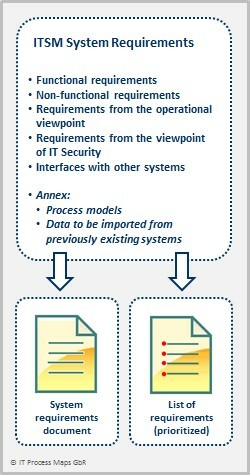 The definitions of the process outputs describe which data are processed within the system. The process Incident Logging and Categorization for example, generates an Incident Record - the system must therefore be able to hold such a data structure and offer suitable user interfaces for viewing and editing. Finally, all non-functional requirements are to be recorded. It is important not to limit oneself to functional aspects when pinning down the system requirements. Operational aspects are equally important, as are possibilities to expand the system – especially if the introduction of further ITSM processes is to follow. The detailed process descriptions from the ITIL Process Map are an important part of the system requirements. In addition to this, checklists/ document templates support the definition of the process outputs. The attributes usually assigned to an Incident Record, for example, can be found in the Checklist Incident Record. Suppliers of suitable ITSM systems are submitted to a systematic evaluation upon the basis of the list of requirements. Firstly, a larger number of suppliers may be approached in writing; the aim here is to find suppliers which are able to fulfill the most important requirements. This results in a short-list of suppliers, who are requested to submit a concrete offer that also contains information about license fees and implementation costs. The final decision is made after a visit by reference clients and possibly a test-installation by the leading contender. The number of vendors included in the selection process should not be too large – the product surveys published by the Gartner  and Forrester  Groups provide excellent assistance when compiling a first list of possible candidates. Which individual steps must be taken for system implementation will depend in a great measure upon the type of application and its operational environment. It is usually most efficient to make use of the system-suppliers' expertise when customizing and implementing the new application(s). The detailed process descriptions and definitions of guidelines and process outputs serve as blueprints for the configuration of the systems. ZDNet.com - by Forrester Research: SaaS ITSM tools: Forrester delivers market overview. -- February 26, 2013.